Soft beds are exactly as we can imagine them… It can feel like sleeping on a cloud! They are much more forgiving, can reduce a lot of pressure, and can make falling asleep much more enjoyable. 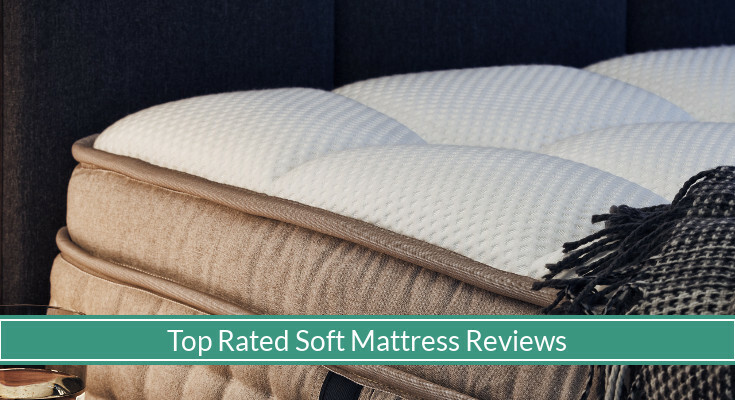 In this article, we look at the good things about soft mattresses, who can benefit from owning one, what makes a great plush mattress, and reviews of our top recommend 10 best soft mattresses on the market. 2.1 Who Can Benefit From Softer Mattresses? The DreamCloud is one of the best soft mattresses on the market. With its hand-tufted, cashmere blend pillow top (expensive, luxury fabric) and 14-inch multi-layer inside, you won’t find a more cloud-like bed to sleep on ever. The layers inside the mattress do use high-density memory foams that do well to maintain a flat surface. However, because of how thin they are, they provide a much more forgiving and softer experience. The thin layers, coupled with gel infusion, and the airways thanks to the micro coil and base coils, the mattress provide a very cool and well-regulated sleeping surface temperature. The mattress comes with a lifetime warranty to protect you from manufacturing defects. It also comes with a stunning year-long trial period, which in our books is all the time in the world to test run a mattress (most competing hybrid mattresses have 90 to 120-night trial periods). It also comes with free shipping with FedEx, white glove service hand delivering the mattress to your room for setup while disposing all packaging and your old mattress. We really can’t find a better customer service and deal for mattress with a luxury sleep experience. For more information, check out our in-depth review on this mattress here. The Latex For Less Mattress is one of the best all-natural, organic mattresses. Built with 100% natural cover, fire barrier, inside material, and a reversible design, you won’t find a better supportive, soft, and bouncy mattress. On the inside, we find the mattress is built with two key, thick layers: a tatalay-construct latex for a “medium” softer layer and a dunlop-construc latex for a “firm” layer. Tatalay and dunlop latex are the two main ways latex is processed during manufacturing. Tatalay is more consistent and open-cell, providing more give and better airways for breathability. Dunlop is more dense and molding for a firmer, more pressure relieving surface. With the softer side up, the firm layer can act as a base layer for deep compression support. The Latex For Less comes with a 20-year warranty to protect you from any defective mattresses. It comes with a 4-month (120-night) trial period so you can spend one-third of the year sleep-testing the mattress until your heart’s content. It also gives you ample time to break in both sides of the bed in case you are curious about the firmer side. The mattress is shipped free and return pickup is also free if you don’t love your new bed. 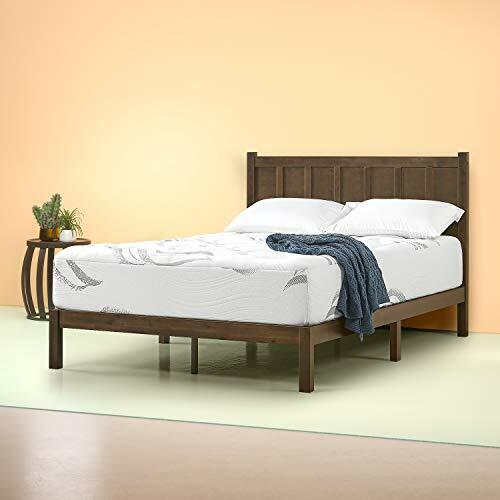 The Best Price Mattress is a top rated inexpensive, soft memory foam mattress. Its upper layer charcoal-infused memory foam with a super soft pressure relief foam supported with a high-density base foam underneath to create a soft and hugging sleeping experience. The mattress is also wrapped in a pleasant poly jacquard cover for a soft touch. 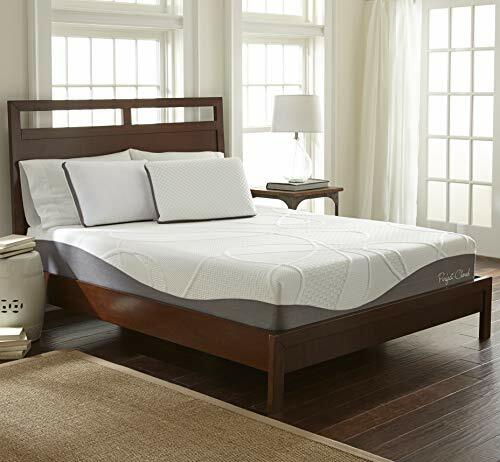 The mattress memory foam helps relieve pressure points on your body, while providing a nice comfortable sink and hugging experience with the top and mid layer. The mattress layers absorb a lot of pressure and even reduces movement motion transfer, which is great for light sleeping couples. There are several thickness available, though thicker tends to be softer with more cushion from the bed base foundation. It also comes with a 10-year warranty to protect from any defective mattresses, and a 30-day return policy covered by Amazon. 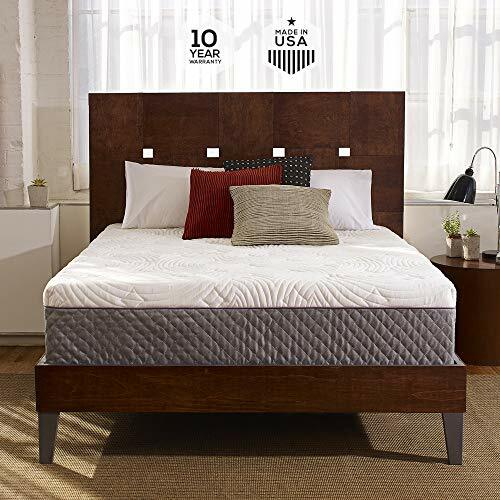 The Zinus Cloud-Like Mattress is another popular low priced, soft memory foam mattress. Much like the Best Price Mattress, it provides a soft sleeping surface with a three-layer construction that can absorb impact and evenly distribute your body weight. The mattress uses a soft-touch and plush jacquard cover made with microfiber and quilted onto a thin foam padding. Underneath, we find green tea extract, charcoal, and natural plant oil infused into the top layer memory foam for a cooler and refreshing sleep. The memory foam provide a contouring sleeping surface, while absorbing bodyweight and pressure. The Zinus Cloud-Like Mattress comes with a 10-year warranty, covering all manufacturing defects. The return policy is based on Amazon 30-day return period. 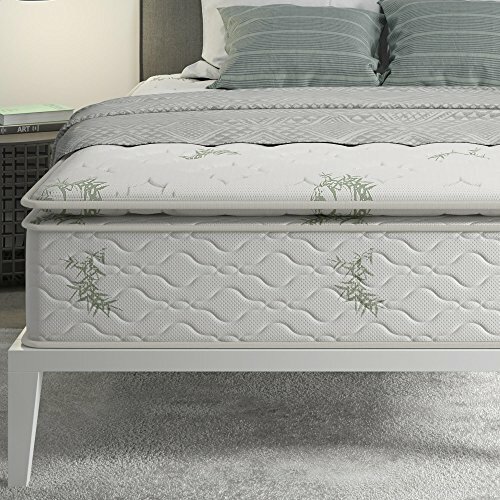 The Sleep Innovations Shiloh Mattress is a simply designed soft bed that provide great sleep at a reasonable price. 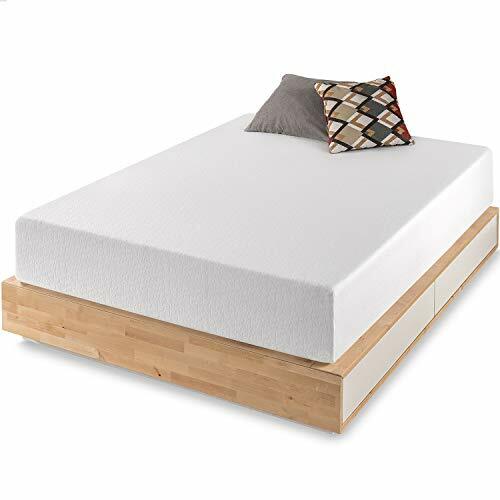 The top layer somewhat thick memory foam provide a cradling experience letting your body sit on a soft surface while its base layer provide deep compression support and give the mattress its shape. The mattress can come in either a quilted cover for a mesmerizing appeal or a classic smooth cover touch. The smooth cover can be removed for machine washing, however the quilted cover is sewned onto the mattress. Please note the mattress warranty can be void if the cover is removed despite being removable (you need to and should be using a waterproof bed sheet cover for longer lasting use). If you are looking for a soft top, the quilted cover will provide a more cushioned experience than the smooth cover. Underneath, we find the “SureTemp” memory foam that provides a thick cushion for supporting the natural curves of your body as you sleep on the bed. To prevent it from sinking further and giving you better support, a thick high density “Support-Plus” foam base gives the mattress its shape. The mattress is tagged as one of Amazon’s Choice for best mattress. It comes with a 20-year warranty to protect from any defective designs, and a 30-day Amazon return period. The Shiloh is great reasonably priced mattress at isolating motion and providing a soft, pressure relieving sleep. It’s also made in the USA. Built to withstand pressure, the Lucid Gel-Infused Mattress provide a highly breathable, cooling sleeping surface for anyone who finds themselves hot at night. 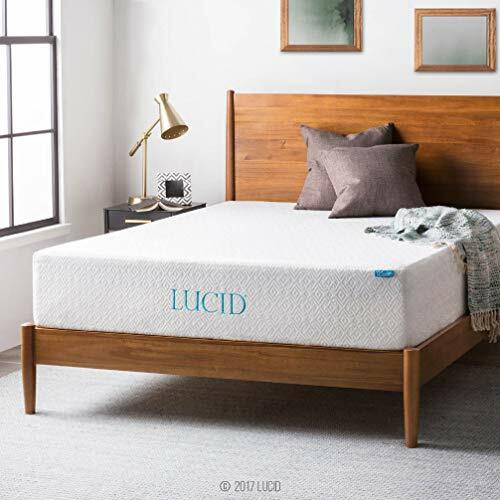 Built with deep-down support, we find the Lucid Gel Mattress to provide the necessary cushion for the body to comfortably rest on while ensuring you sleep just right. The mattress is kept simple with two layers of foam. We find the top layer as a highly breathable, aerated memory foam layer heavily mixed with cooling gel for a good regulated temperature sleeping. We match this cool layer with a Tencel-blend cover, a well-known fabric that breathe extremely well letting heat dissipate without being trapped, and we find ourselves with possibly the most cool sleep bed that doesn’t “break the bank” or our wallets. The mattress maintains its shape with a high-density base foam layer that supports your sleep and memory foam layer from sinking too far in. The Lucid Gel-Infused Mattress comes with a 10-year warranty for protection against any potential manufacturer defects. This highly conforming, heat absorbing mattress also has an Amazon 30-day return period. The Perfect Cloud UltraPlush Mattress is one of the softest mattress we know. With its uniquely designed, stretch-knit plush cover and soft memory foam layers, the mattress lives up to its brand name as a cloud-like bed for a good night’s rest. We start with a premium textile stretch knit cover that can be zipper-removed for machine washable. Underneath, we come across two separate layers of memory foam supported by a high-density foam support base. The top layer is a proprietary air-infused memory foam that provide a plush “hugging” experience for that soft surface sleep, using the right density for allowing a comfortable give and pressure relief. In its second layer, we find visco Gel-Max memory foam infused with cooling gel to help absorb heat from the surface layer and disperse it through the mattress for a better regulated sleeping temperature. Finally, we end upf with a high-density base support foam for a comfortable thickness and deep compression support. The mattress comes with a 10-year warranty to cover any defects that might suddenly appear. The Perfect Cloud Mattress comes with an Amazon 30-day trial period if it doesn’t meet your satisfaction. We find the Perfect Cloud UltraPlush Mattress to be one of the better plush memory foam mattresses we can rely on. The Olee Sleep Galaxy is one of the more popular inexpensive hybrid mattresses on the market. Composed of 5 layers, this thick euro-box pillow-top bed with a fancy, soft-touch polyester jacquard fabric provide a gentle cool sensation while offering a soft plush, bouncy surface to jump onto and call the perfect soft bed. The pillow top layer is a beautiful floral design, with a quilted fiber padded cover that provide a layer that can cushion your entire body. Underneath, we find thin layers of Dura high-density foams that provide a sink without getting a “trapped” feeling. The mid-layer memory foam is infused with gel to help absorb some heat from the sleeping surface. As a base layer, the hybrid mattress uses individually wrapped pocketed coils that work in isolation, minimizing motion transfer while providing a “customizable” support to the curves of your body. The mattress is one of the mattress picks by Amazon’s Choice. It comes with a 10-year warranty for any manufacturer defects, and a 30-day Amazon return policy. The Olee Sleep Galaxy Mattress is one of the best reasonably priced hybrid mattresses available, and can flex and bend well for adjustable bed use. The Signature Sleep is a top pick by Amazon’s Choice as a soft, body-breathing innerspring mattress that is reasonably priced. It comes with a euro-top box that provide an incredible extra soft memory foam padding with a thin layer of foam to pad its high-gauge pocketed coils for an incredibly soft, supportive bounce. The Signature Sleep Pillow Top Mattress uses coils that at 15-gauge in the center for a soft, steady support allowing the pressure of your body weight to be evenly distributed for a marshmallow-like sleep experience. The center is supported with “zone foam” that provide a slightly more firm support in the center to provide spinal alignment. Along the sides, we find the use of 13-gauge steel coils that bolster the edges so sleepers can get on and off the mattress with ease, while maximizing the sleeping surface and prevent any disrupting roll-offs. All these layers are wrapped in a soft-touch rayon material for wicking moisture and providing a cooler, dry and restful sleep experience. The mattress comes with a brief 1-year warranty, and a 30-day return policy backed by Amazon. With a lavishing soft pillow-top padding and pressure relieving soft pocket coils, the Signature Sleep Pillow Top Mattress can make a great soft, bouncy bed for sleep. Another Perfect Cloud mattress makes the list as a reliable top recommended soft bed. The Atlas Gel-Plus Mattress compared to the UltraPlush Mattress is not as soft but does emphasize on a cooler sleep experience. If you find your sleep disrupted often by night time sweating or hot flashes, this soft bed might be best for you. What is unique about the Atlas Gel-Plus is the grid-like channels within the rectangular foam layers. The mattress begins with a stretch-knit woven fabric that feature a mocha-weaving ultra-suede siding for a soft-touch and elegant appeal. “Mocha” provides a soft and warm feel that is breathable and silk-like. Inside the mattress, we find the first top layer to be a soft, dense patented Gel-Plus memory foam. Although the material is considered dense, the formula used creates a forgiving, contouring sleeping surface. To add further support and breathability, layers underneath are comprised of a “bi-directional” open structure for airflow for heat to travel and disperse throughout the mattress easily. This also reduces the overall density of the mattress for a softer flat surface sleep. This mid-priced mattress comes with a 10-year warranty for protecting against defects during manufacturing. It comes with a 30-day Amazon-backed return policy. 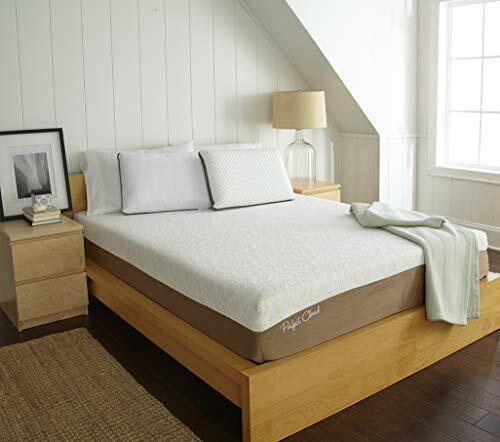 The Perfect Cloud Atlas Gel-Plus Mattress we would consider is a medium soft mattress that can provide a cooler sleeping surface than most mattresses. Soft sleeping surfaces can be extremely comfortable. What can be best described as sleeping on a cloud, soft mattresses provide a gentle sink and hugging experience that can make falling asleep much quicker and deep sleep much more pleasant. Who Can Benefit From Softer Mattresses? As we covered in our firm vs. soft mattress comparison guide, soft mattresses may not be popular, but they can do a great job for many people. We often find reviewers and soft mattress owners having tried mattresses that have been way too firm for their personal preference. Individuals with specific health conditions can sleep better with a soft mattress. Although many back pain can benefit from a firm surface, conditions such as arthritis and scoliosis can be exacerbated and be made more painful when sleeping on a firm surface with too much pressure being applied to your body. Aging individuals may find any mattress called firm to be too much pressure, and in need of a significantly softer and plush sleeping surface. (Mattresses with pillow tops can be considered!) With less muscular and body fat density over time, a soft supportive mattress can be the better choice. Slimmer, lighter sleepers may find better give and support in a soft surface that can alleviate pressure despite lower than average weight. Built with less density and/or higher-gauge coils. In foam-based mattresses such as latex beds and memory foam beds, density plays a large part to how firm mattresses can be. Most will use a high-density base to provide the mattress its shape and to give you deep compression support for when you sink into the mattress. Depending on the thickness of the upper layers and its density, we may find a softer sleep surface to contour and “hug” more than firmer mattresses. Responsive sleeping surface. The responsiveness of a mattress is its ability for the sleeping surface to return to its original shape (flat). Depending on the mattress material, some may take a minute or two while others respond instantly. For example, memory foam generally have the slowest response time while innerspring typically have the fastest. When it comes to soft mattresses, we have to make sure it is responsive at all. With less density and “weaker” coils, the concern is whether the mattress can return to its shape at all. Generally speaking, softer mattresses do have a slightly shorter lifespan because they are more likely to be compressed, begin to sag, or have lingering body impressions. Having a responsive mattress means being able to come home to a bed that is ready to comfort you and provide the best quality rest you deserve. A warranty to protect from manufacturing defects. For a soft mattress, a warranty can be very important because of the less dense and “weaker” coils used in mattresses to produce a soft and plush sleeping surface firmness. Most mattress warranties will protect you from the following: decompression issues, indentations greater than a specified measurement, sagging, and peculiar waves and bumps formed on the mattress that won’t go away. A sufficient amount of time to try and return. Most mattresses especially ones ordered on Amazon are backed by a minimum of 30-day return policy. This is important because it gives you ample time to “break in” the mattress for the sleeping surface to become soft the way you can expect it to for the next several years. More expensive mattresses in higher price class offer a longer trial period, and that can help with ensuring that if you do not find the mattress comfortable, you have time to repackage the mattress or to call a delivery pick-up company to take care of it.